The California State University (CSU) is one of three public higher education systems in the state of California , the other two being the University of California system and the California Community College system. It is incorporated as The Trustees of the California State University. 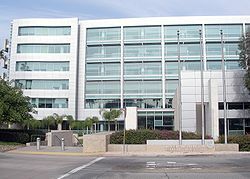 The California State University system headquarters are at 401 Golden Shore in Downtown Long Beach . The CSU system is composed of 23 campuses and has over 417,112 students supported by 47,000 faculty members and staff.It is the largest senior system of higher education in the United States . CSU prepares about 60 percent of the teachers in the state, 40 percent of the engineering graduates, and more graduates in business, agriculture, communications, health, education and public administration than all other California universities and colleges combined. Altogether, about half the bachelor's degrees and a third of the master's degrees awarded annually in California are from the CSU. Since 1961 nearly 2.5 million alumni have received a bachelor's, master's or doctoral degree from the university system. CSU offers more than 1,800 degree programs in some 240 subject areas. Today's California State University system is the direct descendant of the California State Normal School (now San Jose State University ), a normal school established by the California Legislature on May 2, 1862. The California State Normal School was itself derived from the City of San Francisco's Minns Evening Normal School (founded in 1857) a normal school legislature dropped the word "California" from the name of the San Jose and Los Angeles schools, renaming them "State Normal Schools." Later Chico (1887), San Diego (1897), and other schools became part of the State Normal School system. In 1919, the State Normal School at Los Angeles became the Southern Branch of the University of California (now the University of California, Los Angeles ). In 1921, the State Normal Schools became the State Teachers Colleges. By this time most of the campuses started to become identified by their city names plus the word "state" (e.g., "San Jose State," "San Diego State," "San Francisco State"). In 1935, the State Teachers Colleges became the California State Colleges and were administered by the California State Department of Education in Sacramento. The Donahoe Higher Education Act of 1960 gave the system greater autonomy from the State of California. The postwar period brought a great expansion in the number of colleges in the system. Campuses in Los Angeles, Sacramento, and Long Beach were added between 1947 and 1949. Then seven more were authorized to be built between 1957 and 1960. Six more campuses joined the system after the establishment of the Donohoe Higher Education Act in 1960 bringing the total number to 23. In 1972 the system became The California State University and Colleges, and all of the campuses were renamed with the words "California State University" in their names. Former San Diego State University student body president Calvin Robinson wrote the bill, signed into law by Ronald Reagan, that allowed every California State University the option to revert the schools back to their pre-1972 names: San Jose State, San Diego State, San Francisco State, etc. In 1982, the CSU system dropped the word "colleges" from its name. Today the campuses of the CSU include comprehensive and polytechnic universities and the only Maritime Academy in the western United States that receives aid from the federal Maritime Administration. Responsibility for the California State University is vested in the 25 member Board of Trustees, whose members are appointed by the Governor of the State of California. There are 5 ex officio Trustees; the Governor, Lieutenant Governor, Speaker of the Assembly, State Superintendent of Public Instruction, and the CSU Chancellor. There are 4 special Trustees. The CSU Statewide Alumni Council appoints an Alumni Trustee. The Governor appoints a Faculty Trustee from nominees proposed by the Statewide Academic Senate. The Governor appoints two Student Trustees from nominees proposed by the California State Student Association. The Alumni and Faculty Trustees serve for two years. The Student Trustees serve staggered two-year terms. The sixteen remaining Trustees are appointed by the Governor, confirmed by the State Senate, and serve for eight years. The Trustees appoint the Chancellor, who is the chief executive officer of the system, and the Presidents, who are the chief executive officers of their respective campuses. The California State University's permanent, collective endowment has grown to $874 million U.S. dollars as of the close of the 2006-2007 academic year. In addition, each of the 23 campuses of the CSU raise their own funds through donations and other external funding, and each campus controls its own separate endowment funds not counted in the above endowment amount. During the fall 2004 semester the system employed 11,069 full-time faculty members. The vast majority, 68.3% were tenured or tenure tracked with 59.2% having tenure. Professors comprised 86.6% of faculty members with a plurality, 43.6% being full professors. Associate professors consitituted 18.6% and Assistant professors 24.4% of faculty members while 13.4% were instructors and lecturers. The percentage of full professors declined 31.4% since fall of 1999, while that of assistant professors has risen 57.4%. The CSU system requires faculty to sign a loyalty oath dating from the Cold War. Some campuses (most recently CSU Fullerton) have refused to hire academics who have refused to sign one, although others have provided for accommodations such as signing statements. Quakers have been particular victims of this policy. Both university systems are California publicly funded higher education institutions. Despite having fewer students, some individual UC campuses, as a result of their research emphasis and medical centers, have larger budgets than the entire CSU system. CSU's Chancellor, Dr Charles B Reed, pointed out when delivering his Pullias Lecture at USC, that California was big enough to afford two world-class systems of public higher education, one that supports research (UC) and one that supports teaching (CSU). However, student per capita spending is stretched far thinner at the CSU, and the lack of a research mission or independent doctoral programs under the California Master Plan leads to a perceived lack of prestige among some academics. For many of the CSU system's early formative years, the more powerful UC system was able to delay or prevent the CSU campuses from gaining the right to grant bachelor's degrees, then later master's degrees and now doctorates in most fields. Thus while similar campuses in other states (e.g., Arizona State University) eventually grew from normal schools into research-oriented state universities, the UC system's powerful research university monopoly has successfully prevented the CSU from experiencing a similar development. Librarian Emeritus Kevin Starr has described the CSU as "in so many ways the Rodney Dangerfield of public higher education." According to the California Master Plan for Higher Education (1960), both university systems may confer Bachelors or Master's degrees as well as professional certifications, however only the University of California has the authority to issue Ph.D degrees and professional degrees in the fields of law, medicine, veterinary, and dentistry. As a result of recent legislation (SB 724), the California State University may now offer the Ed.D degree (also known as the Doctor of Education or "education doctorate degree") to its graduate students as well as certain types of professional doctorate degrees (for instance, audiology (Au.D), etc.). Additionally, the California State University (CSU) offers Ph.D degrees as a "joint degree" in combination with other institutions of higher education, including "joint degrees" with the University of California and accredited private universities. This is why, for instance, San Diego State can qualify as a "Research University with high research activity" (Carnegie Foundation link) by offering 16 doctoral degrees. There are 23 CSU campuses and 10 UC campuses representing 414,000 and 191,000 students respectively. The cost of CSU tuition is approximately half that of UC. Thus, the CSU system has been referred to by former California State University authorities as "The People's University." An impacted campus or major is one which has more CSU-qualified students than capacity permits. As of 2006, CSU Long Beach, San Diego State, and Cal Poly SLO are impacted for both new freshmen and for transfer students, while CSU Fullerton, Cal Poly Pomona, and Sonoma State are impacted for new freshmen. Thus, these campuses have higher admission standards than the CSU minima. In addition, some programs at other campuses are similarly impacted. Despite this, CSU undergraduate admissions are quantitatively based and generally do not include items such as personal statements, SAT Subject Test scores, letters of recommendation, or portfolios. In addition, there is geographic preference given to those residing within the commuting areas of the colleges. The UC system follows a consistent style in the naming of campuses, using the words University of California followed by the name of its declared home city. Most CSU campuses follow a similar pattern, though several are named only for their home city, such as San Jose State University or San Diego State University. A few of the colleges follow neither pattern, in particular the California Maritime Academy (Cal Maritime) and the California Polytechnic State University (Cal Poly), the only campuses whose official names do not reference their location in California. Some critics, including Donald Gerth (a former President of California State University, Sacramento), have claimed that the weak California State University identity has contributed to the CSU's perceived lack of prestige when compared to the University of California. The University of California and most of its campuses are members of the Association of American Universities , while the California State University (CSU) and several of its campuses (including San Diego and San Jose ) are members of the American Association of State Colleges and Universities . ABET, Inc., (formerly the Accreditation Board for Engineering and Technology), accredits post-secondary degree programs in applied science, computing, engineering, and technology. It is intended to certify the quality of these programs. There California State University has 17 ABET-accredited engineering colleges throughout California. U.S. News rankings of California State University best undergraduate Engineering programs accredited by the ABET in order. The CSU is a member of the National Association of State Universities and Land-Grant Colleges. A comprehensive applied agricultural and environmental research program joining the CSU's four colleges of agriculture (at San Luis Obispo , Pomona , Chico and Fresno ) and the state's agriculture and natural resources industries and allied business communities. Managed by the San Diego and Chico campuses, the California State University Program for Education and Research in Biotechnology (CSUPERB) provides vision, leadership, and support for biotechnology education and research throughout the CSU to promote biotechnology in California. CSUPERB was created in 1987 and designed to channel CSU system-wide resources and catalyze interdisciplinary, inter-campus, synergistic endeavors involving Biology and Chemistry departments as well as Engineering, Agriculture and Computer Science. The interdisciplinary nature of biotechnology includes areas such as bioengineering; agricultural biotechnology; human pharmaceutical and health applications; environmental and natural resource biotechnology; molecular ecology; marine biotechnology; and bioinformatics and computational biology as they are applied to molecular questions. CSUPERB also recognizes basic research in the molecular and cellular life sciences as contributing to biotechnology, and serves as the official liaison between the CSU system and industry, government, the Congressional Biotechnology Caucus, and the public arena in all biotechnological matters. Headquartered and administered at the Dominguez Hills campus, the CSU Statewide Nursing Program offers registered nurses courses available throughout California that lead to Bachelors' and Masters' of Science degree in Nursing (awarded by the closest participating CSU campus). See also California Postsecondary Education Committee (CPEC) Reports on CSU Statewide Nursing Program for more information. Designed to increase the pool of potential faculty by supporting the doctoral aspirations of California State University students who have experienced economic and educational disadvantages. Provides financial and other assistance to individuals pursuing doctoral degrees. The program seeks to provide loans to doctoral students who are interested in applying and competing for California State University instructional faculty positions after completion of the doctoral degree. The CSU intends to expand its post-graduate education focus to establish and encourage Professional Science Master's degree programs using the Sloan model (see link for further discussion). Home Page. California State University. Retrieved on December 6, 2008. Human Resources, California State University Office of the Chancellor, 2005. Kevin Starr, Coast of Dreams: California on the Edge, 1990-2003 (New York: Alfred A. Knopf, 2004), 583.